Gov. 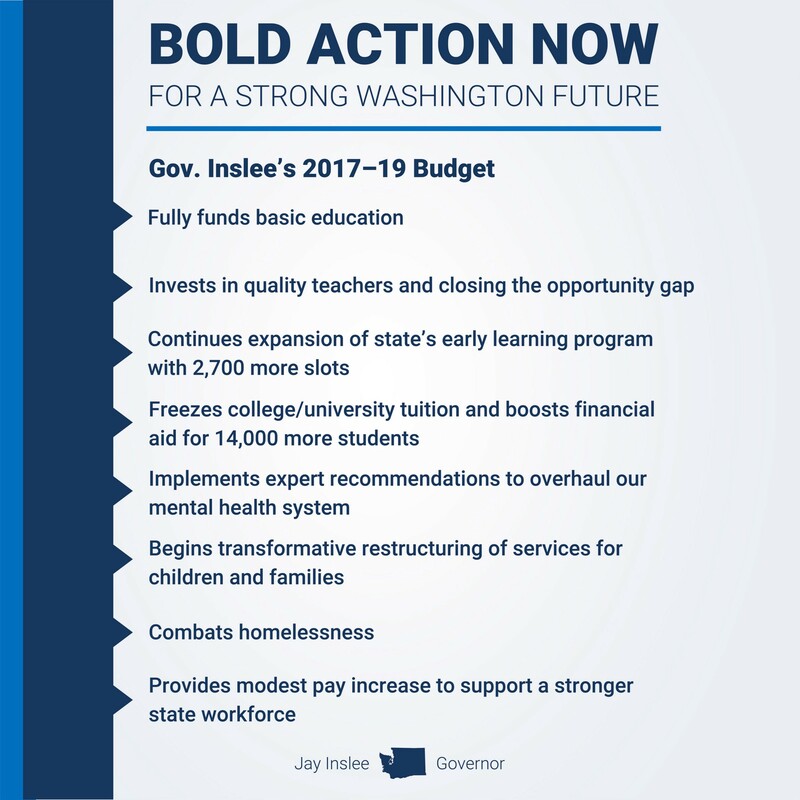 Jay Inslee on Wednesday released his 2017–19 budget proposals which include plans for a major overhaul of the state’s troubled mental health system. His proposal would create a patient-centered system with sizable new resources for treating people in the community. The mental health investments in Inslee’s budget will provide more capacity in the community to help people avoid hospitalization and modernize Western State Hospital’s staffing and operations. Under Inslee’s proposal, Western State would focus on serving forensic and hard-to-place civil commitment patients while many civil commitment patients would be served at nine, new state-run 16-bed regional hospitals. 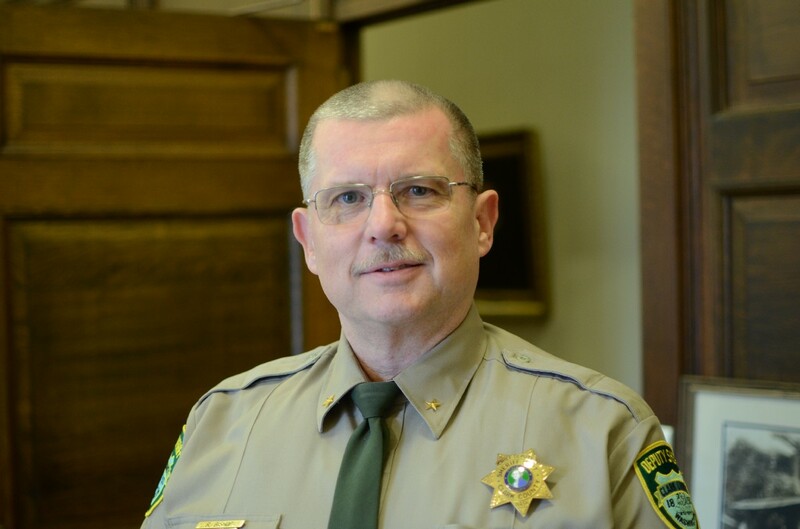 The proposal, based on recommendations from outside experts, also provides more mobile crisis response teams; walk-in centers that allow 23-hours stays for people in crisis; and 100 additional mental health beds for people with a criminal history, or substance use disorder, to keep them out of jails. The governor’s operating and capital budgets include $300 million for those changes, among others, to address the state’s growing mental health needs. Inslee says a key challenge in tackling mental health is its interconnectedness with other issues such as homelessness, opioid addiction, and behavioral health integration. 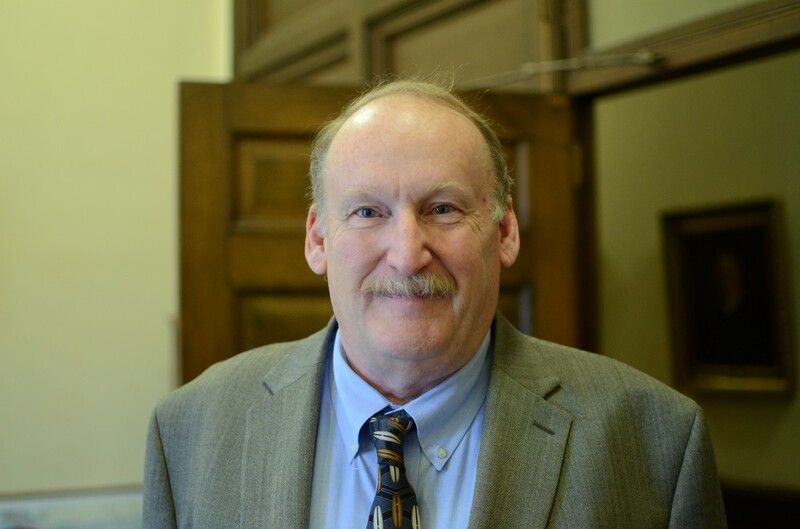 His operating and capital budgets also provide nearly $120 million to combat homelessness, including more support services for the chronically homeless, families and youth. The governor’s capital budget includes funding for more than 1,700 new affordable housing units and to preserve thousands of existing housing units. And Inslee proposes funding for proven opioid treatment options and consultation support for medical providers. The need for action is clear, the governor said. While Washington’s fast-growing economy and quality of life are attracting an influx of new people and businesses, the state’s mental health system is in trouble. Washington has the nation’s second-highest prevalence rate of adults experiencing a diagnosable mental health condition, at an estimated 24 percent, yet has lagged the country in providing timely access to behavioral health services. And at Western State Hospital — one of the largest state-run psychiatric hospitals in the nation — a cascade of issues including too few staff, too few discharge options, a lack of accountability and a crumbling infrastructure has led to poor outcomes for patients, their families and staff. These issues were exacerbated by severe budget cuts during the Great Recession. Inslee took steps to address the problems, including replacing the hospital’s entire leadership team, improving security in the hospital and aggressively recruiting additional nurses, evaluators, psychiatrists and others to strengthen safety and provide high-quality care. Recognizing the need for longer-term reforms, the governor, in concert with the Department of Social and Health Services and legislative leaders, brought in independent consultants to study the state’s mental health system and make recommendations for improvements. One finding reaffirmed a key issue that’s made it difficult to address issues at Western: The flow of patients through the state psychiatric hospitals system was clogged. Patients must wait too long to get into the hospital because it is full. The hospital is full because many patients can’t be discharged in a timely manner due to a lack of appropriate community care settings. The backlogs not only stress the hospital system, but almost every other part of the larger mental health system as well. Perhaps most significantly, the consultants found Washington’s model of using its two, large psychiatric hospitals to provide most services is inconsistent with best practices. Peer states have switched to a more decentralized, community-based approach for civil commitments. Inslee’s mental health proposal embraces three main strategies: hire additional staff and make much-needed improvements at Western State Hospital; move civil commitments to the community; and speed up access to mental health care in the most-effective and least-restrictive settings. $67.5 million to provide 180 additional psychiatric staff at the state’s two hospitals, 137 of which would go to Western State Hospital. Consultants found that Western State’s staffing levels are 25–50 percent lower when compared to other states. $99.7 million for 356 new community alternative placement beds that prioritize the transition of clients ready for discharge from the state psychiatric hospitals who have additional long-term care or developmental disability needs. $3.7 million to build nine, new state-run community based hospitals by 2023. Research shows that when treatment is delivered close to home, patients stay more connected with friends, family, prescribers and support professionals at community mental health agencies. This promotes better health outcomes. $8.2 million for 320 additional permanent supportive housing slots. Hundreds of patients at Western State are ready for discharge but have no place to go. The governor’s budget provides for an array of supported discharge options — from highly structured residential programs to basic supportive housing. $2.8 million for case-managed housing to provide 100 more beds for people with a criminal history, substance use disorder and/or mental illness to keep them out of jails. All told, the governor’s budget would add more than 1,000 new beds and nearly 700 staff positions to the state’s mental health system. 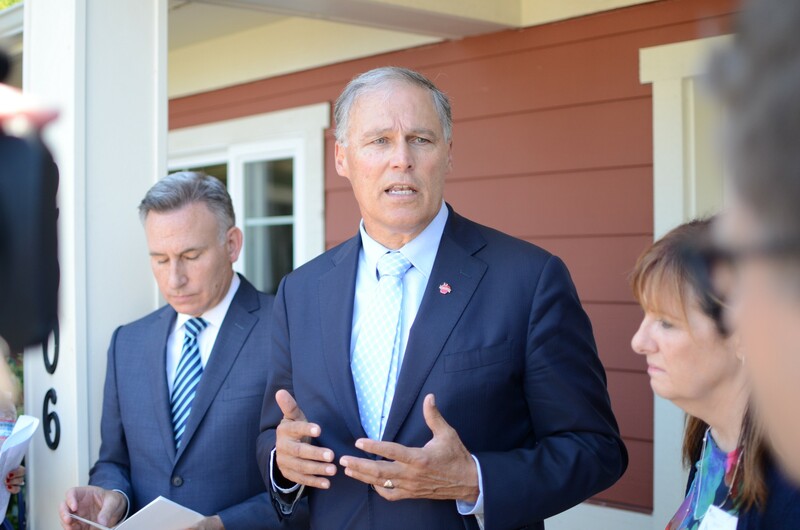 Inslee today also discussed other aspects of his budget, including $10 million to begin the restructuring of state services for children and families, as recommended by his Blue Ribbon Commission on Delivery of Services for Children and Families. Education composes more than half of state spending in Inslee’s budget. The governor rolled out his funding plan yesterday to fully fund K-12 education, and his budget released today shows further investment throughout the education continuum, with expansion of early learning to serve an additional 2,700 children, up from about 11,700. The governor’s budget would freeze tuition at all two- and four-year colleges and provide $55 million to the institutions to offset what would have been a 2.2 percent tuition increase. Inslee also boosts financial aid by $146 million which will give an additional 14,000 students access to State Need Grants. These investments will help make progress toward the state’s educational attainment goals that by 2023 all Washington adults will have a high school diploma and at least 70 percent of adults will have some form of postsecondary credential. Saying an effective government depends on being able to recruit qualified state employees, the governor is also proposing modest pay increases of 6 percent over the next four years, with additional increases to boost recruitment and retention efforts for certain employees, such as state troopers and psychiatric hospital staff. In addition to releasing his 2017–19 operating budget, Inslee shared his capital and transportation budgets. His transportation budget largely supports the projects approved by legislators in the historic 2015 transportation investment package and adds funds to reduce traffic on Interstate 405 and build capacity on I-5 in Seattle and state Route 167 in Puyallup. Inslee’s capital budget has a strong focus on schools, with about $1 billion for school construction as well as funding for water projects along the Yakima River, Columbia River Basin and the Chehalis Basin.